As seen in the table, the signs ു [u], ൂ[uː], ൃ [rɨ] changes the shape of the base consonant grapheme. It was not until the 1971 orthographic reformation these signs got detached from the base grapheme. You can see the detached form as well in the rows 5,6 and 7 of the above table. 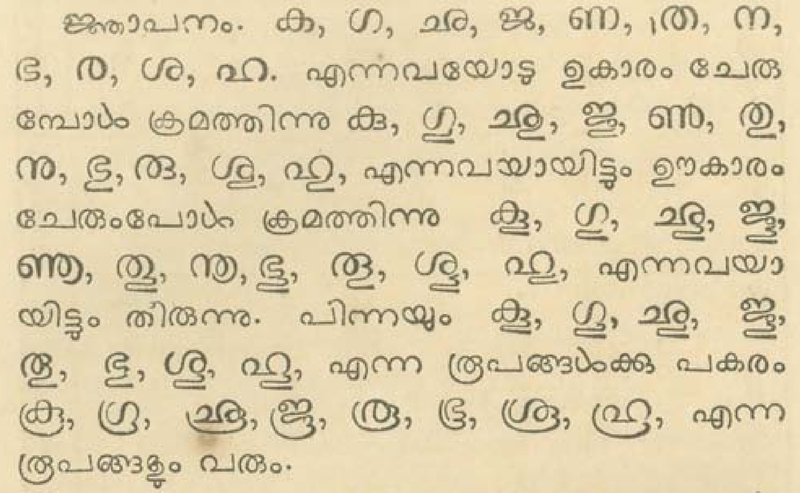 In the exhaustive script set of Malayalam there are in fact 8 ways in which ‘ു’ [u] and ‘ൂ’ [uː] sign marks change the shape of base consonant grapheme. These 8 forms (u- 4 forms and uː - 4 forms) are consolidated below. ഗ(ga), ഛ(ʧʰa), ജ(ʤa), ത(t̪a), ഭ(bʱa), ശ(ʃa), ഹ(ɦa) gets modified by a shape that resembles a tail that comes back to right after moving left. Those conjuncts which end with these consonants also assume the same tail shape when ‘ു’ [u] vowel sign appear after them. ണ(ɳa) and ന(na/n̪a) changes their shape with an inward closed loop. 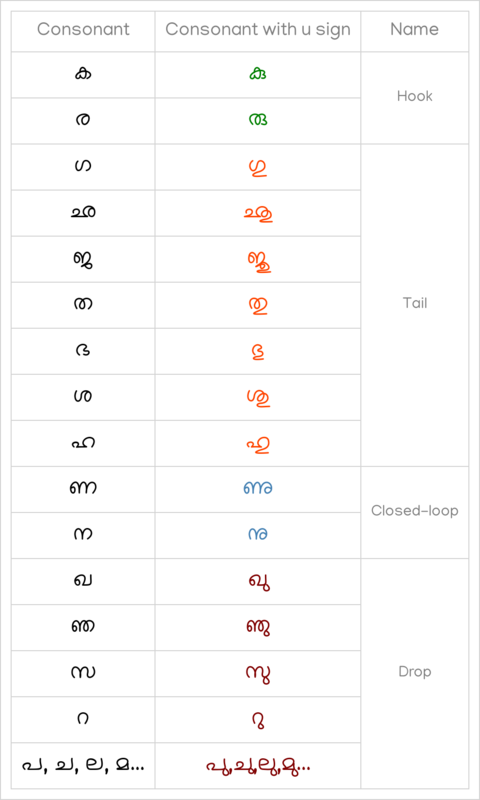 Those conjuncts which end with these consonants also assume the same loop shape when ‘ു’ [u] vowel sign appear after them. For example ണ്ണ(ɳɳa), ന്ന(nna), ക്ന(kna) etc. 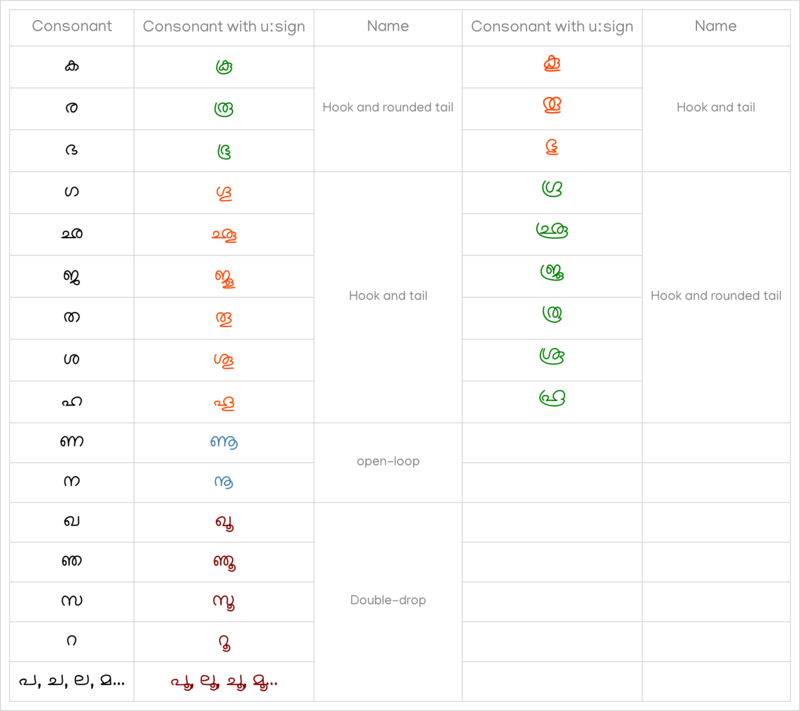 All other 24 consonants use the double-drop shape. As it is the most popular among all [u] signs, it is often mistakenly used instead of the other signs mentioned above. 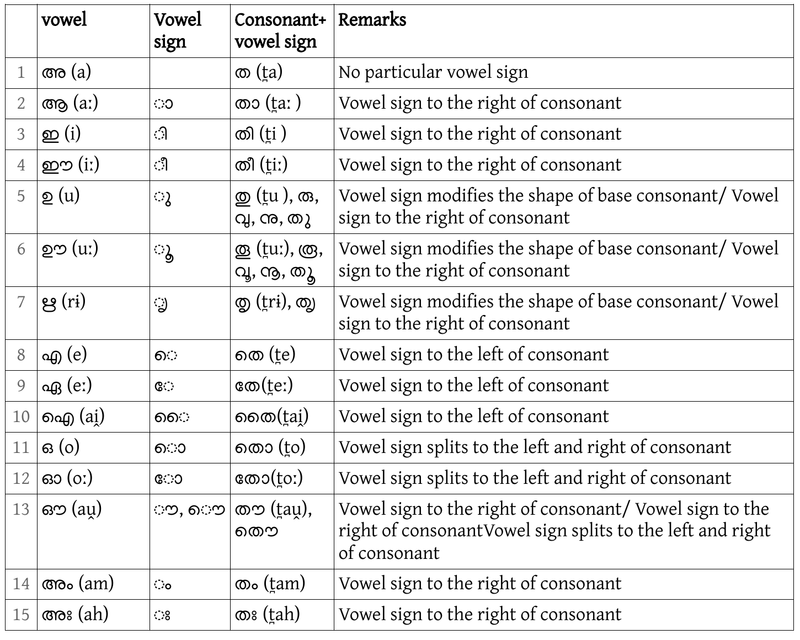 Modern textbooks do not detail the ‘ു’ [u] and ‘ൂ’ [uː] vowel sign forms. The earliest available reference to the script of Malayalam and its usage is the book from 1772, Alphabetum grandonico-malabaricum sive samscrudonicum.. 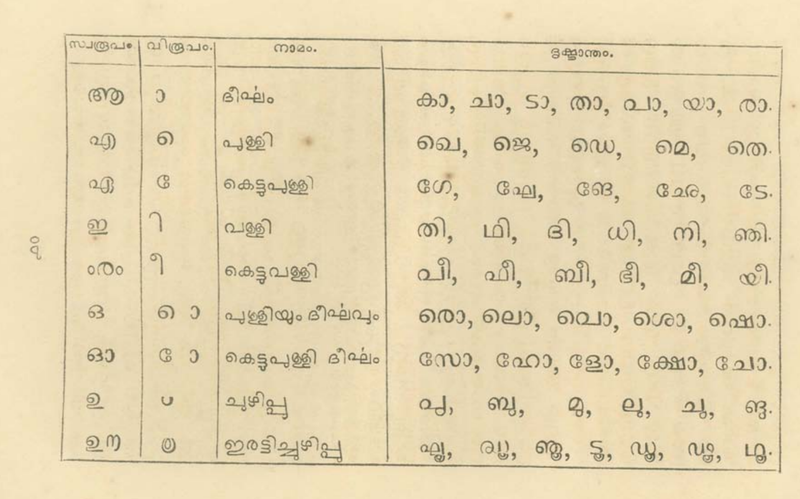 It was a text book meant to be used by western missionaries to Kerala to learn the Malayalam script and its language of description is Latin. Alphabetum describes various vowel sign forms but it does not give any indication on the hook and tail form. ക(ka) , ര(ra), ഗ(ga), ഛ(ʧʰa), ജ(ʤa), ത(t̪a), ഭ(bʱa), ശ(ʃa), ഹ(ɦa) etc. uses the hook and rounded tail form only. 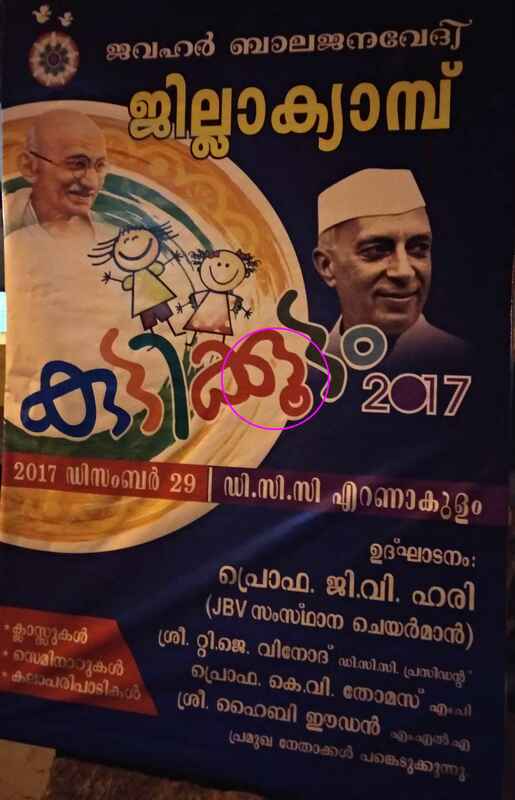 This being the first ever compilation of Malayalam script usage, that too by a non-native linguist, there are chances for unintended omissions about which I am not sure of. The metal types used in this book were movable, and were the first of its kind to be used to print a Malayalam book. 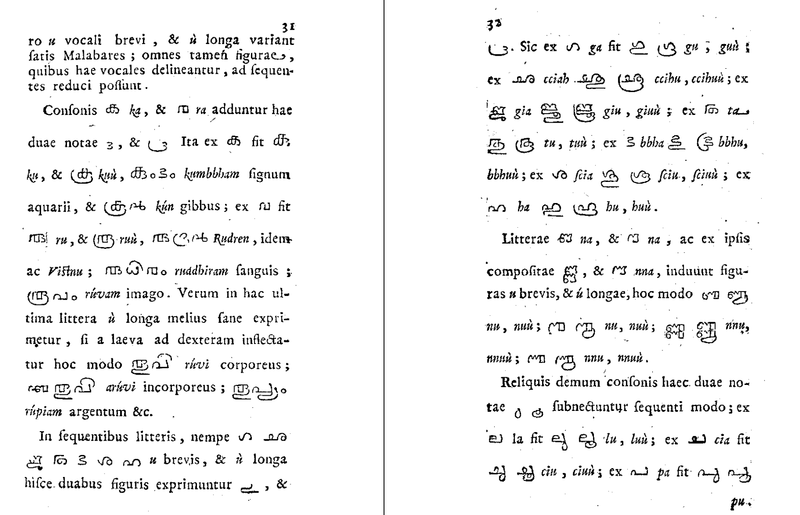 The same types were used to print the first ever complete book in Malayalam script- Samkshepavedartham. A still later work in this regard was done by Rev. George Mathan, almost a century later to Alphabetum. He introduces drop/double drop for ‘ു’ [u]/ ‘ൂ’ [uː] as the common sign form while all others shapes are indicated as exceptions. He clearly mentions about the two alternate forms of hook and tail as well as hook and rounded tail in his book on the Grammar of Malayalam.